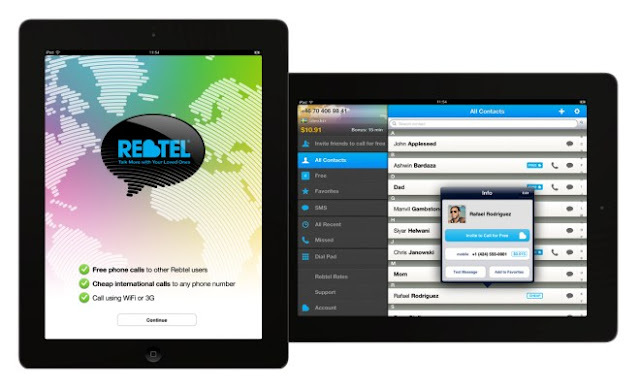 Rebtel iPad Application for Free Calling from iPad | Free Pc to Phone Calls, Free Voip Calls to India International ! If you have got yourself an iPad and thinking why haven't I purchased Galaxy Tab with calling feature, then trust me stop regretting as you have made an absolutely great decision. And the decision is more valid now with the launch of Rebtel application for iPad. I too have an iPad and it has already replaced my laptop, infact it has in some sense replaced my phone as well. I am now using iPad for all my local, national and international calling. With the launch of Rebtel app for iPad, you can now easily place phone calls from your iPad (just like as you do with your mobile phone). The best part is that these calls are really cheap and affordable (even lower than what your telecom provider charges you on your mobile). I am sure you must have used Facetime and Skype on your iPad. Well Rebtel is a similar service (it being second largest voip service), just it has some additional features and it way cheaper than skype. So today we will be looking at Rebtel iPad Application which can turn your iPad into a phone. If you are already a rebtel customer, then you can directly install and login to your account. Otherwise first you will have to register with them and then login to the app. Rates as Number One application in 13 App stores. This is not just a copy of their iPhone app: featuring optimized navigation for both portrait and landscape view, higher resolution graphics and a new design,. It gives a completely new experience on your iPad. You'll never need another iPad phone app. Free Rebtel to Rebtel Calls : You can make free calls to any friend who is also using Rebtel either on his smartphone (android, iPhone, Blackberry or windows mobile) or his tablet or on is computer. Use internet to place the calls. Low Cost SMS : Super cheap international text messages. Send sms to over 200 countries. First Free Call : Just download the application and you will be awarded with free 5 minutes. No managing of contacts (or adding contacts to the app) : The app will automatically check your address book and will show you which of your friends are using Rebtel application (call them for free). Well there is always something extra for our blog readers. Sign up with Rebtel using this special link. Get Free $10 credit on purchase of $10 credit. So you will get $20 credit when you purchased just $10. That's double your money. Please note its a limited time offer, avail this before its too late. Should you go for it ? I mean so many people just can't be talking crap. Search internet, use Google, ask your friends and you will know. Rebtel is way better than your normal calling card : you get a cheap, reliable voip service which you can use to call your friends and family back home!